Choosing an iron door for your home is like selecting art that becomes the focal point at your home’s entrance. Fine craftsmanship and a unique iron door design set your home apart, immediately establishing magnificence and enhanced curb appeal. Equally important, the iron door represents security and longevity. Portella Iron Doors offers a vast selection of styles – from old world iron doors to modern styles with clean architectural lines – that are superior in quality. Built to last a lifetime, each iron door is handcrafted from heavy-duty materials. Iron doors – traditionally ornate in design – once represented opulence and social standing. Today, a plethora of iron door designs enable homeowners to choose the style to suite their home’s architectural design. 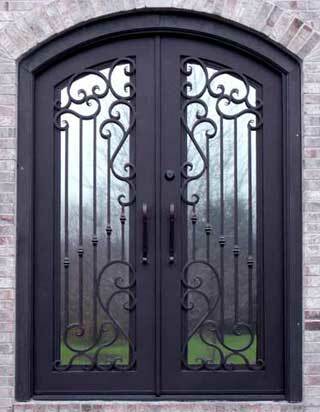 Portella Iron Doors custom manufacturers each iron door to customers’ specifications. Choose from a wide range of traditional designs to create the essence of old-world elegance throughout your home or find sleek modern entries and iron doors that complement a contemporary home. The exclusive Architect Series features European-influenced designs that integrate steel and glass with enhanced sight lines and weatherproofing qualities. Architects, builders and homeowners find versatile iron doors and windows that showcase available light throughout your home and create openness while also providing the added benefit of improved security. Portella Iron Doors offers ultimate flexibility. Choosing iron door style, shape, size, color and iron door finish to create a distinctive entrance or architectural detail for your home. We craft hand-forged iron doors with only the best materials, whether you choose a wrought iron door, bronze or copper finish. Stone. Metal. Wood. Stucco. Ceramic. Iron Door. Fine homes combine textures exquisitely in the interiors and architectural design to create a unique balance with nature. Creating a home’s ambiance through fine details like an iron door in the entrance or iron doors throughout the home can enhance the beauty of stonework and custom wall finishes.